« Episodes in my Life: Does anyone still darn? 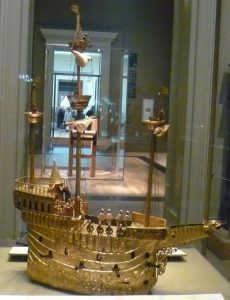 This is one of my favourite objects in the British Museum. 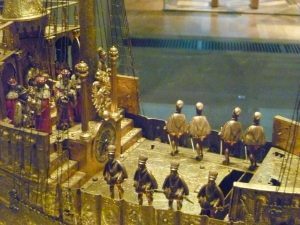 It’s an automaton of a nef, that is, a model of a galleon, the state of the art ship of the 15th-16th centuries which epitomized European power and expansion at the time. 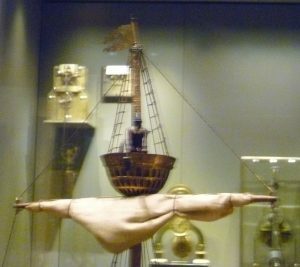 The model shows an ungainly-looking vessel whose massive sails are furled, and with its foremast, a main mast and mizzen mast sticking up with the crows’ nests awkwardly curled round them. 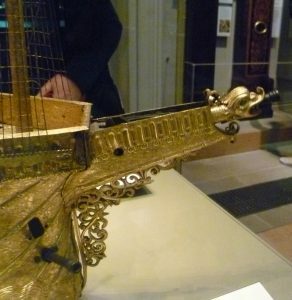 Gilded copper and iron nef, c.1585, 90 cms high from the port side. 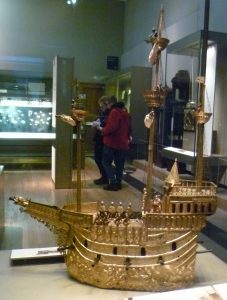 In reality, and with the four huge sails fully spread, the galleon would have been transformed from something merely impressive into a vessel of speed, beauty and tenacious purpose, which opened up a world of trade and conquest for ambitious European rulers. Top crow’s nest with sailor and furled sail underneath. First, using clockwork, it was a twenty-four hour clock which struck every quarter and on the hour. 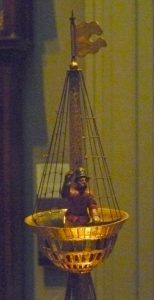 The sailors in the crows’ nests revolved every quarter hour and struck the quarters and the hours with hammers on upturned bells. The bottom deck of the nef has sixteen primed cannons protruding from the portholes. Above the main deck, behind the main mast, the Holy Roman Emperor Rudolph II sits on a throne while his seven Electors, accompanied by three heralds, stand before him. When in action, the seven Electors with their heralds circled past the Emperor and bowed as they received their fiefs, that is, land held in return for tribute. Nowadays, all the Electors look much the same but originally, each would have been differentiated by his costume and his herald would be distinguished by his lord’s coat of arms. Doubtless, the Elector Augustus I’s children would have been able to point proudly to Papa. Below, on the main deck, ten trumpeters and a kettle drummer took turns in announcing the banquet. And another drummer and three guardsmen loaded and fired the cannon – all by working by clockwork. Nowadays, there aren’t enough figures remaining to do all the loading, announcing and firing etc. – I can only see eight men standing on the main deck, and we know that more soldiers originally stood on the rear deck, too. 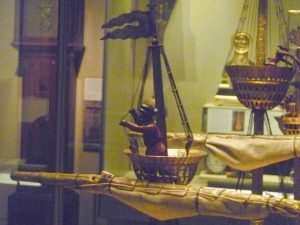 However, the nef’s main raison d’être was to announce the subsequent royal banquet by moving down a long wooden table while the tops of the galleon’s masts twirled round and a small pipe organ played a tune and drumsticks beat on a skin stretched across the bass of the ship’s hull. It would pause to allow the ceremony of the Emperor receiving the seven Electors before continuing its stately journey down the table. As a finale, it fired the dragon’s head cannon on the bowsprit which, in turn, ignited a fuse which fired all the other cannons. The noise and smoke must have been tremendous – and, one would think – very dangerous. The U.K. is full of railway engine buffs who spend their lives repairing steam locomotives and restoring old branch lines to full working order. Surely there is someone out there would love to make a working replica of this wonderful nef; or, failing that, a meticulous computer animation of it in full working order. I’d love to see it making its way down a long 16th century oak banqueting table, sailors’ bells striking the quarter hours, the Electors and heralds bowing and passing in front of Emperor Rudolph II, and soldiers firing the cannons, not to mention the pipe organ and the drumming. Why not? I’m sure it would give pleasure to lots of the British Museum’s visitors. What a fabulous thing! They really were clever mechanicians and so inventive. I agree with you. Some nerdy engineer really ought to make a replica with all guns blazing! It would be tremendous and bring hordes to the museum. I’m so glad you agree, Elizabeth! I’ve noticed how much people enjoy anything that’s interactive in exhibitions. When I went to the Celtic exhibition at the British Museum, they had a button you could press to hear what a Roman war trumpet sounded like – and people were queuing up to press it. The noise was unearthly and, had I been a Celtic warrior, it certainly would have terrified me!